Good morning! 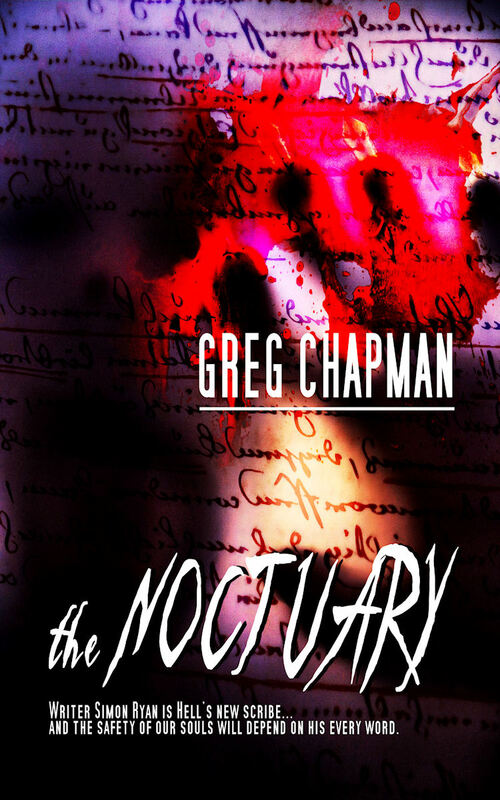 Greg Chapman is over here today, talking about his new novella, The Noctuary. Welcome, Greg! I’ve always enjoyed creating new characters and worlds in both written and illustrative form, ever since I was a boy, but it wasn’t until after I started studying journalism at university in the late 90’s and read the work of Edgar Allan Poe in a literary theory course that I first got an appreciation for horror. In 2009 I joined the Australian Horror Writers Association and the rest, as they say, is history. 2) Tell us about your latest book, The Noctuary. The Noctuary centres on writer Simon Ryan, who discovers that he is destined to become a Scribe for a group of hellish creatures known as The Dark Muses. Simon finds that his soul is literally on the line unless he uses his gift to write evil into the lives of humans. To prove himself he has to go back and rewrite a tragedy from his past. 3) How did the experiences of writing, editing, publishing, and promoting Torment and Midnight Theatre affect your approach on The Noctuary? Were there any ‘lessons learned’ that you were able to apply? As Torment was my first published book-length work, the entire process of publishing and promotion was new to me. Thankfully I already had entered the various horror fiction networks via the AHWA. Ultimately I think I was selling myself as an author rather than the book with Torment, whereas The Noctuary is something completely different and truer to my voice. The collection Midnight Theatre: Tales of Terror mostly comprised stories that I’d already had published and the only reason I published it was as a support to Torment at the time. I thought that if readers liked my collection they might like Torment. The fact MT:TOT was free was also an obvious incentive. I like to play around with themes and challenge my characters at the psychological level. Mostly my tales are supernatural, but I like to inject them with a strong sense of humanity to make the impossible or fantastical elements seem more real. I also love building dread and suspense in my stories – that core requirement with horror fiction. 5) What are your thoughts on the future of books? The future is already happening. E-books are simply another tool for authors and publishers to release their work and I’m all for it. Paperback books will always be with us and thankfully many small presses are still releasing the odd collectable hardcover. I believe that if readers continue to support the small horror presses then there will always be exceptional horror stories to be told. 6) What do you find toughest about being a writer, and how do you get past it? The toughest part of being a writer is the fact, that at the moment, I’m not doing it full-time. I still have a day job and although I’ve had a lot of success over the past year with my writing and drawing, I’m still determined to work towards mainstream publication. 7) You’re a member of the Australian Horror Writers Association. How has that helped you develop as a writer? Considerably. After joining in 2009 I applied for the AHWA’s mentorship program and I was selected. Under the tutelage of Brett McBean I saw my first short story published and started writing Torment and The Noctuary which would eventually be published two years later. Apart from that I have made numerous connections with many great authors, including the likes of Rocky Wood, president of the US Horror Writers Association, whom I later collaborated with on the graphic novel Witches! 8. Who would be the perfect reader for The Noctuary? The Noctuary is a homage to author Clive Barker, one of my favourite authors, so any Barker fans would get a lot out of it I think. Fans of dark fantasy and the “fantastique” would also enjoy the book. 9) What’s next for you, if you can share it? I’ve got two novellas in the works and I’m going back to rewrite a novel to turn it into a trilogy, but all that depends on where my imagination takes me. The next published work will be the graphic novel tentatively titled Witches! which will be published by McFarland Publishers early in 2012. For more on Greg and his projects, visit him on the web here.